A few months ago I was intrigued by a number of reviews which had called the remake of The Evil Dead the best horror film in years. I allowed such high praise to influence my decision to see the movie, and in the end I kind of regretted it because I actually did not find that particular film to be too frightening. 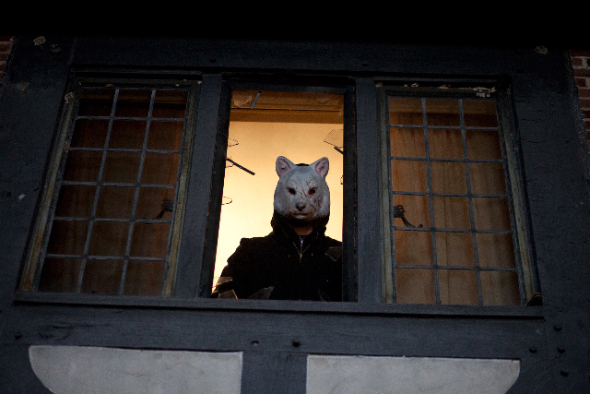 You’re Next has received similar acclaim, and once again I was swayed by all the positive write-ups, particularly by one moniker proclaiming it “the best slasher since Scream“. Why? More on that later. Here’s the thing about horror; it is perhaps the most subjective of all movie genres. We can discuss certain factors which make classic horror films appeal to a broad audience such as addressing shared cultural anxieties or the act of commenting on a contemporary trend, but the real truth is that each individual cinema-goer has a different perspective on what is terrifying. I would like to argue that a horror film should not be solely judged on how scary it is. Of course that is a damn important part of it, but we should ask ourselves the same question we ask of all films, and that is simply is it entertaining? Personally I did not find this a truly horrifying experience. I lost no sleep over the film, I was not traumatized by anything which occurred therein, and at no point did I have to hide my face in my hands because I simply could not bear to watch. Does that make it a bad horror film? Not really. I mean sure Halloween and The Shining were scary enough when we first saw them, but if we liked them, then the experience of each subsequent viewing must surely be similar to the one I just described. Familiarity means that we view these films for entertainment rather than scares. Familiarity co-existing with a satirical going-against-the-grain attitude is a key part of what makes You’re Next an enjoyable movie to watch. It has no pretensions of being groundbreaking, instead taking familiar elements like the masked intruders stalking a family in a secluded location (done so brilliantly in the 2008 chiller The Strangers) and adding to them some of the darkest humour I have ever seen in a horror film. Barely twenty minutes is spent establishing who the characters are before the terror begins and half of them meet immediate untimely deaths, yet none of the victims feel one-dimensional. From there on the pace never falters and a clever plot unfolds as various horror conventions are brought crashing to the ground. Going against the slasher type, the masked killers are by no means supernaturally invincible. The character of Erin (Sharni Vinson) is a genuine delight. We have all had those discussions about what you need to do in order to survive a horror movie, and to me it seems like Erin was created in response to all those hypothetical chats. Having grown up in a paranoid survivalist compound, she is perfectly at home setting traps for her would be slayers just as Nancy did in A Nightmare on Elm Street. Slasher connoisseurs will also appreciate the fun ways in which standard tropes like making sure the killer is dead are played with, not to mention the various nods to slasher classics of old. In the end this is a love letter to both the slasher sub-genre and the slasher fan; a smart deconstruction of standard practices, I agree that it is the best slasher since Scream, and it works for the same reasons that Wes Craven’s biting spoof of the genre did. No, this is not an utterly nightmare-inducing, pant-wetting fright-fest, but it is a fun ride that will make you smile as often as it will make you jump out of your seat. P.S. Why was I so captivated by the tagline “best slasher since Scream“? I am thrilled to announce that starting this weekend I will be writing a second weekly feature for Geek Pride alongside Free Film Friday. Slasher Saturdays will be the forum in which I explore the entire history of the slasher film, from the very beginning. I hope you check it out, I can’t wait to get started!